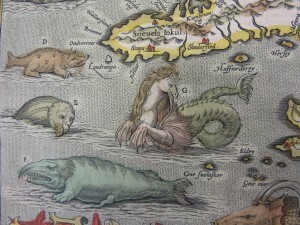 monsters from the deep would be as natural as portarying an Elephant in Africa, while the opening up of trade with foreign lands and voyages of discovery made sea travel an important part of late Medieval and Tudor times. 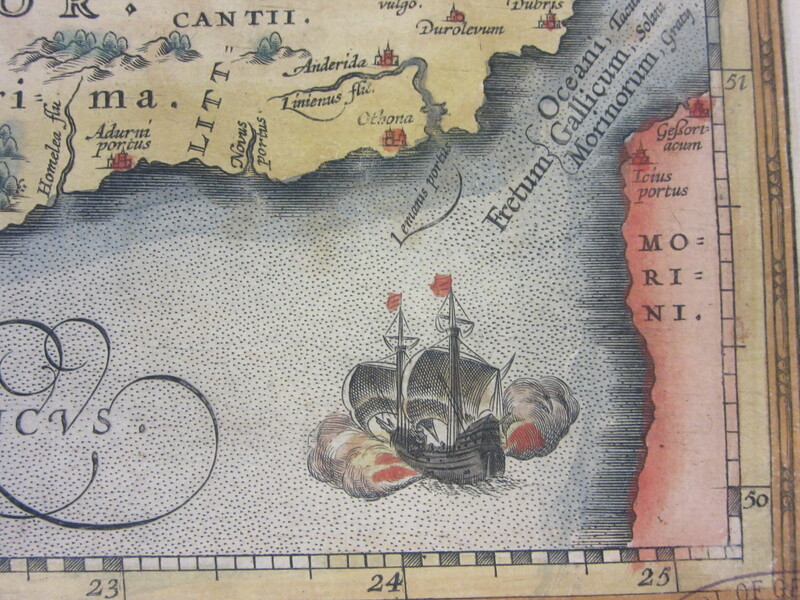 has in its top left corner one of the more dramatic images of shipping to be found amongst the maps held. 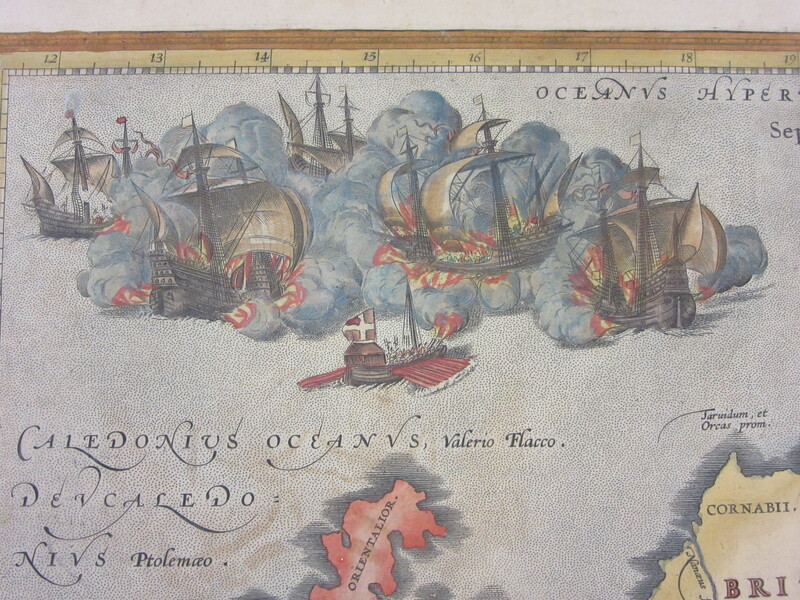 In a cloud of smoke and explosion a sea battle takes place as a smaller ship advances, firing from the bow and flying what appears to be a flag of Denmark. 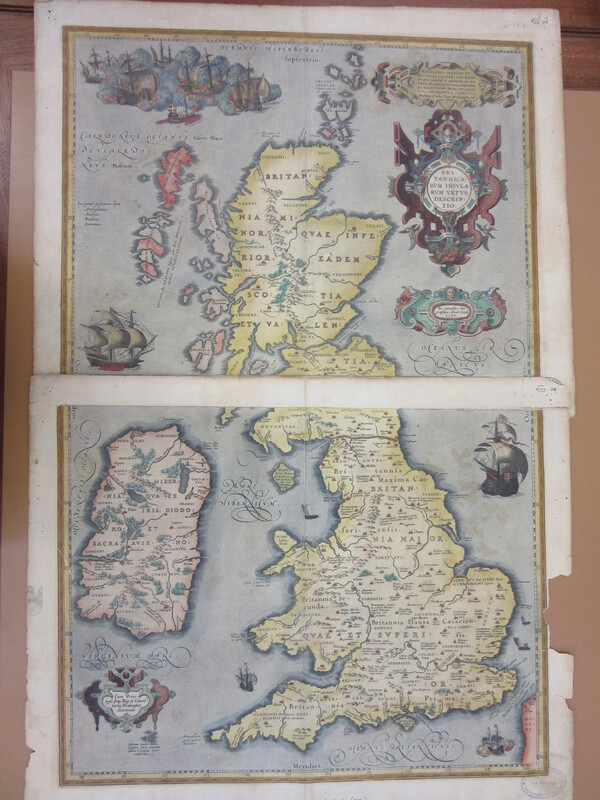 Walls and was published in 1590. 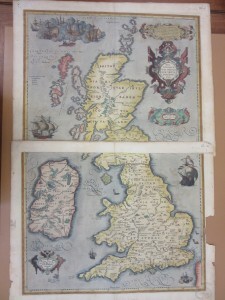 This would date the map to the time of the Spanish Armada, which set sail in 1588. As the Spanish fleet rounded the North coast of Scotland and started to sail down past Ireland fierce storms sunk many of the ships, though there was no battle of the type depicted on Ortelius’s map. 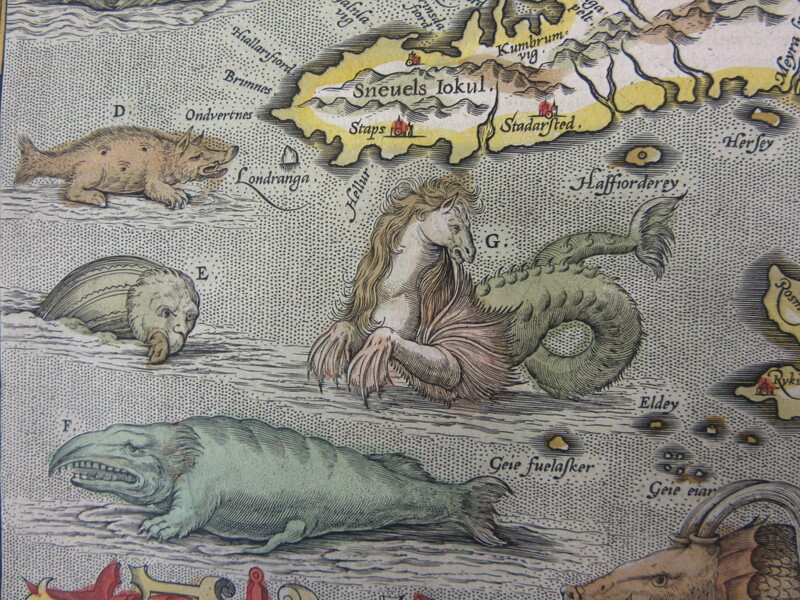 This image of a sea-horse off the coast of Iceland comes from a lavishily illustrated copy of Abraham Oretlius’s Theatrum Orbis Terrarum, published in London in 1606. 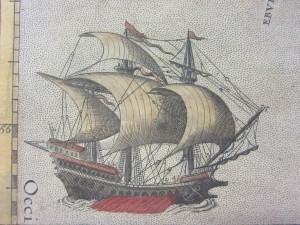 The sea-horse is described as ‘often dothe fisherman great hurt and skare’. 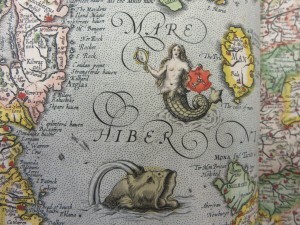 The picture of the Mermaid holding the flag of the Isle of Man at the start of this piece also comes from Ortelius. This entry was posted in Uncategorized on 30 November 2015 by stuart. To mark the opening of the Kiel Canal in June 1895 Kaiser Wilhelm II and the German Government held a regatta at the entrance to the canal, and invited representatives from the nations whose flags, pennants and ensigns are shown in the panel on the right of the map featured here, including Britain, Spain, France, the United States and Italy, to take part. 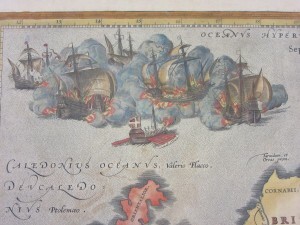 The map shows the ships of the different nations lying at anchor in the Kiel Fjord. Those with crowned heads of state onboard are indicated by the large crown symbol, ships with lesser members of royalty by a smaller crown. The Kiel Canal is an important link between the Baltic and North Seas, and when completed enabled German ships to move between the two without making the long and often stormy passage around the coast of Denmark. Two years after the 1895 celebrations Germany began to enlarge its navy. By 1905 it had replaced the navies of both France and Russia as the benchmark in which the strength of the British navy was measured. By 1912 Admiral Tirpitz, Head of the German Naval Office, ‘insisted that Germany could not fight a war at sea until the widening of the Kiel Canal was completed’. In 1914 the canal was widened to finally be able to allow the passage of Dreadnought battleships through from the Baltic to the North Sea. 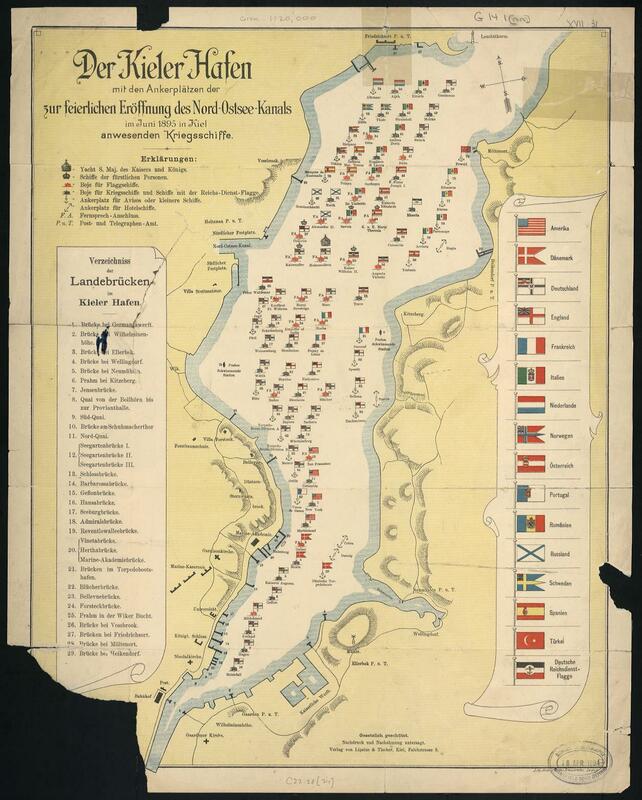 This map, ‘Der Kieler Hafen : mit den ankerplätzen der zur feierlichen eröffnung des Nord-Ostsee-kanals im Juni 1895 in Kiel anwesenden kriegsschiffe’ was published in 1895 at a scale of ca.1:20,000 by Lipsius & Tischer in Kiel. 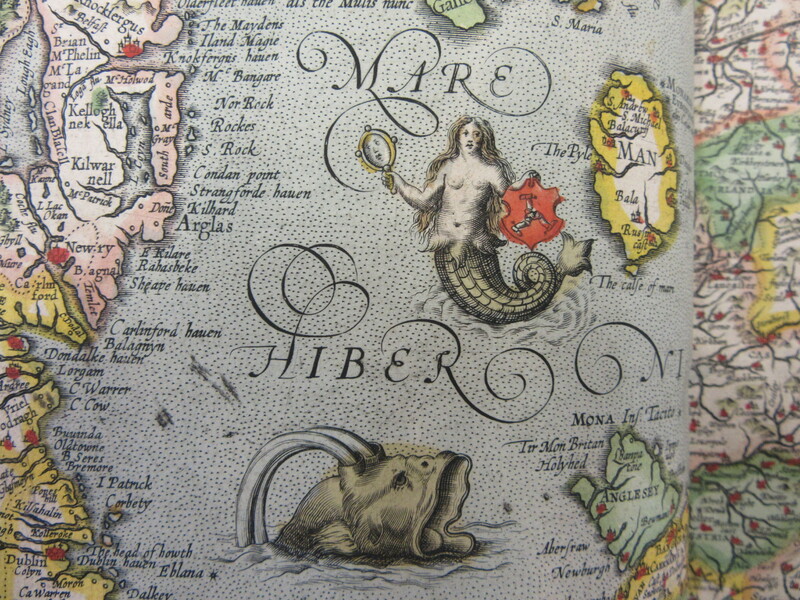 The shelf mark for the map is C22:28 (74). This entry was posted in Uncategorized on 13 November 2015 by stuart.